This is the first in a new series. There are plenty of moves that the Mets have made that have become infamous. Fans spend years arguing over them. Many wonder ‘oh what could have been’. To honestly assess any move, it is not enough to look back years later and see that the move didn’t work out. True intellectual honesty requires one to evaluate the decision at the time it was made. This series will focus on those moves at the time they were made. There are many articles which document the worst trades ever. Click here, here, here or here to see one of many articles explaining why the Nolan Ryan for Jim Fregosi trade was one of the worst in MLB history. (Outfielder Leroy Stanton was also sent to California, but this article doesn’t focus on him.) Looking back, there is no doubt that the Angels got the better end of the deal. The Ryan Express only got chugging in 1972 with a journey out west. With that said, let’s look at the top reasons why the Ryan trade made sense at the time. Jim Fregosi was on Fangraphs ‘all-decade’ team for the 1960’s. This table shows that of the most used Mets starters, Nolan Ryan was the worst. Besides for his ability to whiff guys, he struggled. From 1969-1971 the Mets had a 0.547 winning percentage, which was second best in their division and tied for third in the NL. The problem was that during this period, they had extremely poor offense. Of the 12 NL teams, the Mets among the bottom third in every major category. They ranked ninth in runs scored, hits, homers, OBP and OPS. They were eighth in team batting average and tenth in slugging. In layman’s terms, the Mets needed pop. In the era before free agency, the only quick fix was on the trade market. To make matters worse, the Mets had very little production from their third basemen over the years. It was a horrible black hole. The best stat to look at is sOPS+ for anyone playing third base for the Mets in a given year. For those unfamiliar with stats, it gives the OPS+ relative to that of the league in the same year. (100 is average) The goal is to see offensive production compared to the rest of the MLB. Here you can see how bad the Mets were historically. 1971 was a particularly awful year as Bob Aspromonte put together a most dreadful of seasons. In 1972, Jim Fregosi was 30 years old. In those days, this was often a player’s prime. Many stars would even peak a few years later. Up until that point, Fregosi made 6 all-star teams and got MVP votes eight times. As an Angel, he had a slash line of .268/.340/.403 and had a lot of power for a shortstop. He clubbed 115 dingers before age 30. From 1963-1970, his average WAR was a whopping 5.6 per season. There was of course one downside. Fregosi had a tumor removed from his foot in 1971 and the Angels were concerned about his future. Nevertheless, the Mets thought he could be productive even if he somewhat declined. Moving Fregosi to third made sense considering it is a position that requires less running such a move is common for aging players. 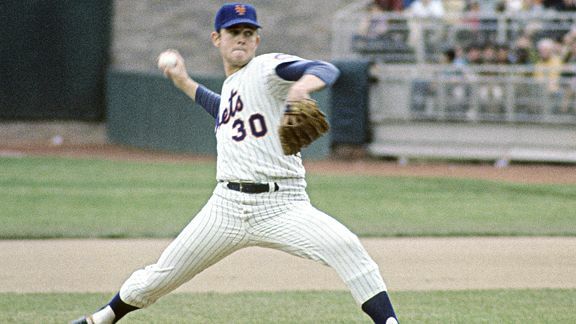 Here is the most main reason the Mets traded Nolan Ryan. He simply wasn’t that good. The stats from reason 5 shows that. Ryan was wild. Sure, he could throw hard. The problem was that he walked the ballpark. He had four full seasons with the Mets and didn’t prove that he could be productive. In an era where wins and losses were important, Ryan was 29-38. He tossed a mere 13 complete games and 2 shutouts when everyone could do that. Going back to the Sadecki and McAndrew comparison… you guessed it. Both had more complete games and shutouts than Ryan during that period. Could Ryan’s lack of success with the Mets been due to a bizarre quirk? During the time Ryan was a Met, the umpires in the two leagues had different equipment. American League umpires had a large mattress-like chest protector worn over the shirt. This led to a situation in which umpires in the two leagues were not calling the same pitches strikes. The AL was a high strike league while the NL gave lower strikes. This is important since Nolan Ryan was a high ball pitcher. This has led to much speculation. Had AL equipment been the standard, would Ryan have dominated with the Mets? Had Ryan been traded to an NL team, would his career have been unremarkable and ended shortly thereafter? We will never know. Could Ryan’s improvement been due to this chest protector? While it is clear that the trade didn’t go as well as planned, the initial thinking wasn’t flawed. Ryan played another 22 seasons and became one of the all-time greats. Fregosi played in just 146 lackluster games with the Mets over the course of a season and a half before being shipped off to Texas. The Mets got the raw end, but no one in 1971 thought that Ryan was going to be the unparalleled strikeout king. While the Mets looked bad, it is hard to have imagined that he would have had much success had the Mets kept him.